As I mentioned in my write up about Nacpan Beach, the further north you head away along the west coast of Palawan from El Nido, the stronger the surf seems to get. And Duli Beach was no exception. When we first rolled up, all you could really see and hear was this beautiful blue water crashing up on to the shore. Just like Nacpan, I was quite intrigued by this as Palawan is not usually synonymous with surfing. Yet here was another beach that had waves that were easily big enough and consistent enough to surf on. The sand was a beautiful golden colour and a very fine texture and from the shore to the water, it was at least 30 to 40 metres. The beach itself stretches on for over 2 kms. The waves were consistently 1-2 metres high and were almost perfect as they broke. This is definitely a better place for surfing than Nacpan if you are that way inclined. This place is definitely more geared up for water sports as you are able to hire surfboards, kayaks and other water sports equipment. However, this isn’t really a place for scuba diving although there is island hopping available. There were even fewer people at Duli Beach than there was at Nacpan. However, there are a few more little restaurants that were very much local style. We decided to take a walk south along the beach and to my amazement, there was a resort at the end of the beach. 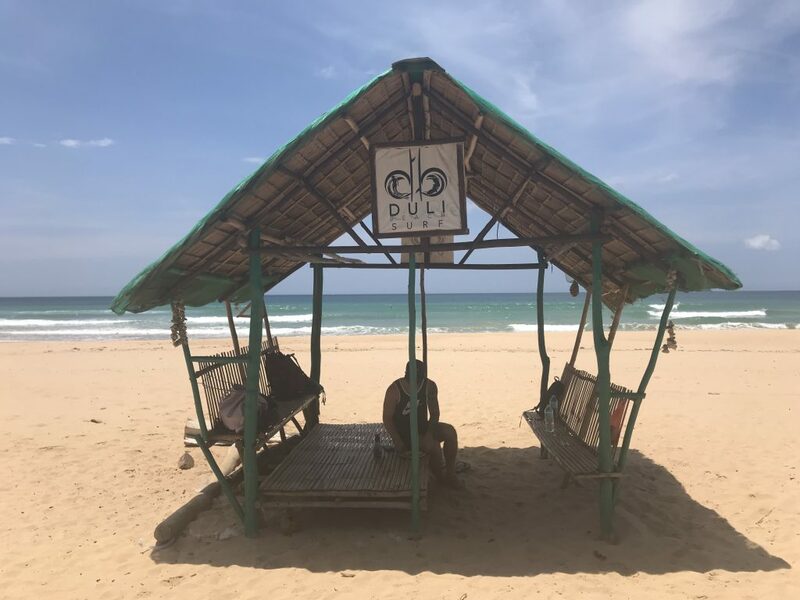 The resort is called Duli Beach Resort and is owned by a young Dutch couple who have been there for about four years. The resort isn’t a luxury resort by any stretch of the imagination. However, they have about 8 bungalows that had open fronts and a verandah. They had a nice little restaurant and although we didn’t eat there, the menu looked alright. This is the only place on Duli Beach that has accommodation. If you are looking for a truly relaxing beach that isn’t crawling with tourists, then you must visit Duli Beach. If you are a surfer, even better! Either way, with beautiful golden sand and the bluest water you will ever see, you won’t be disappointed. You can also check out my Vlog which will give you a real good look and feel for the place. There wasn’t much shade on the beach aside from this hut. As you can see, the beach and the water is so clean. You can see from the photo how much shore front there is. This is one of the cleanest beaches I have seen in the Philippines. Chilling in the hammock in the hot afternoon sun out the front of Duli Beach Resort. The rocks right at the southern end of the beach out the front of Duli Beach Resort. Please click below to watch my vlog about the best surf beach in El Nido! 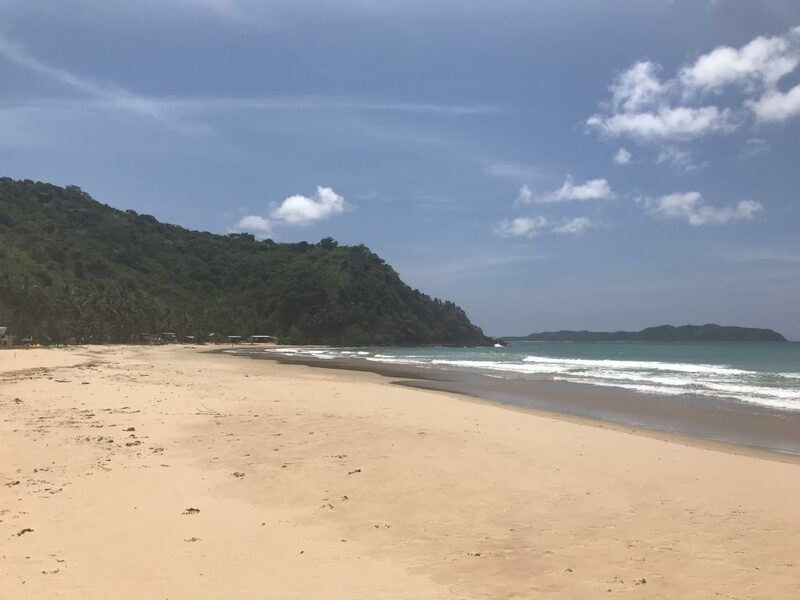 Duli Beach is about 25 kms from El Nido town proper and you are able to hire a van/car to take you to Duli Beach for about P1500 for the day. However, like most places in the Philippines, you need to haggle. The trip takes about 45-50 minutes. You can also take a tricycle to Duli Beach from El Nido town proper which is a cheaper option. However, be prepared for a bumpy ride. As mentioned earlier, the road from the highway is unpaved and can be very uncomfortable. 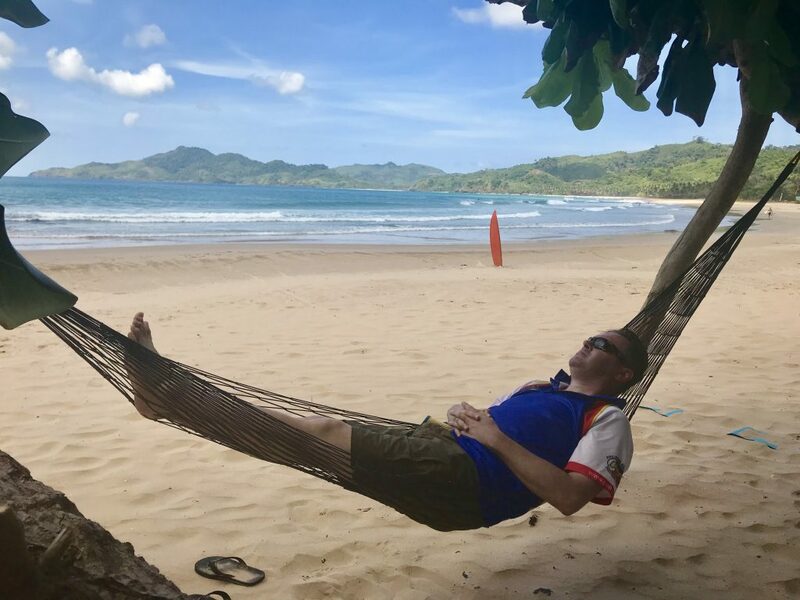 A lot of people tend to hire motorbikes and ride to Duli Beach which is also a good option as you can also use it to ride around and check out a number of the beautiful places on the outskirts of El Nido. You can hire a motorbike/scooter for about P500 for the day. 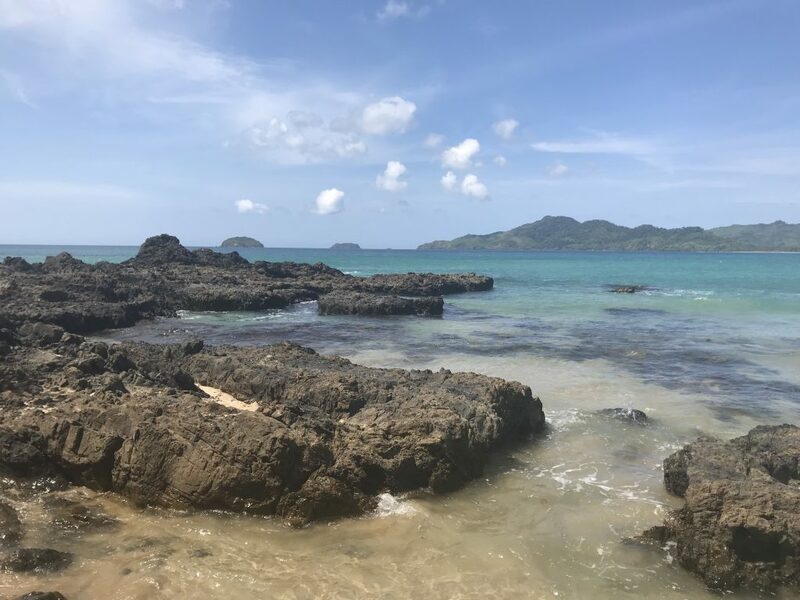 This is a relatively easy day trip from El Nido town proper but just like Nacpan Beach, you need to be prepared for a bit of rough and tumble. Once you get off the main highway, the road to Duli Beach are unpaved, dusty and very bumpy. So make sure you are prepared for the rough ride which lasts for about 4-5 kms.